in response to what he/she is seeing. systems are not communicating well with each other. computer for writing and do less by hand. Below are approximations for the developmental sequence for drawing strokes. This varies highly as all children develop differently. Children begin drawing by scribbling randomly. Some may scribble up and down in a vertical direction, side to side, and in circles. sidewalk chalk or washable paint outdoors. without tires, etc. There are commercially available workbooks with "finish-the-drawing" activities for purchase. the shapes and strokes they are learning. strokes from top to bottom-- This will help when learning to write letters. Tac-Toe or Connect Four, as examples. Play games that incorporate movement and stamping the feet: military marching while calling out "left-right-left-right"
Put a sticker on the back of the right hand or a rubber band on the right wrist. Or have child wear a wristwatch. 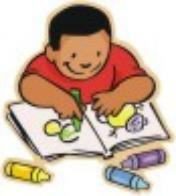 Play "I Spy" games and emphasize the right or left sides of the room, or on the page if using a book. Hand-over-hand guidance is often needed to help a child get the feel for drawing a stroke or writing a letter. easel or even on paper taped to a wall. A slant board can be placed on a desktop for writing tasks. Tummy writing: helps with developing shoulder stability and an upright head. This can be done for writing, drawing and play activities.